RABI linguists work globally to remove language barriers, helping our clients change minds, develop businesses, and make the world a smaller place. Our interpreters are found at corporate conferences, business meetings, law offices, courtrooms, educational programs, and the corridors of government agencies. With our interpreters’ help, our clients serve their customers and communities with equal access and expand business opportunities worldwide. 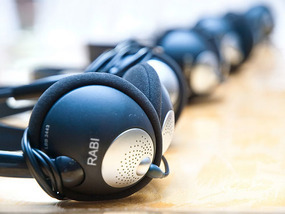 RABI offers interpretation services in more than 100 languages and dialects. We have the scale and expertise to address all your interpretation needs, including hard-to-find languages, high-volume projects, security clearances, and specialized subject areas. Our qualified interpreters are supported by the latest technology and equipment, so that we can help interpret any kind of meeting or conversation. We have helped hundreds of global businesses and organizations communicate effectively across languages. > Read our Interpretation Fact Sheet for more details. > Read our whitepaper, How to Hire an Interpreter, to ensure your event goes smoothly. To speak with a RABI language specialist about your interpretation needs, please call or email us today. Why Should You Use a Professional Interpreter? Maybe your colleague speaks two or three languages. Find out why it's a bad idea to rely on him for your interpreting needs.